Published: Sept. 15, 2008 at 09:51 a.m. The Steelers defense held Jamal Lewis in check and the potent Browns offense to just six points. CLEVELAND -- Fresh off catching an 11-yard pass and scoring the game's only touchdown in Pittsburgh's 10-6 victory over Cleveland Sunday night, Hines Ward turned his back to the jeering Browns fans and scraped his cleats into the end zone, tossing wet turf into the rain and swirling wind behind him. A human lawn job of sorts. "I was marking my turf," the Steelers wide receiver said. Though the gesture was meant as retribution to fans whom Ward said spoke bad about his "mama," it also may have symbolized Pittsburgh (2-0) staking its place as the class of the AFC North. Cleveland and cross-state Cincinnati are winless in two games and Baltimore had the momentum of a season-opening victory put on hold by Hurricane Ike. Those teams are already playing catchup -- again. Pittsburgh, at this early stage of the season, is the team to beat in the North, as it routinely is, once the trendy picks have to actually beat the Steelers to make their turf. Cleveland was the flashy pick to leapfrog the Steelers after it finished 10-6 last season and looked like a team on the rise. Cincinnati was there a few years ago, but has fallen to the wayside. When expectations and grandeur that are so foreign to some franchises finally come calling, reality tends to set in. The supposed upstarts have to live up to the hype and motivated opponents. Often times, that's too much to bear. That's where Pittsburgh, which possesses a humble, but threatening swagger, feels it has an advantage. "Cleveland had a great year, they have great talent, but we are the division champion from last year," Ward said. "We do have a nucleus of guys with the exception of a couple players here or there. We've been through the hard times. We know what it takes week in and week out. We don't overreact. We don't care if we don't get all the pub." Cleveland's season hardly appears to be spiraling toward failure. It was stout against Pittsburgh's offense and it seemingly has the personnel to compete with just about any team in the NFL. Yet its mental makeup might not quite be to the level of its longtime bitter rival from Pittsburgh. For the Browns, players and even managerial personnel declared this game as a "must win" and hugely important, seeing as the Steelers had beaten them nine consecutive times before kickoff. Now the slide has reached double digits, currently the longest consecutive games losing streak to a single opponent in the league. It is too early to declare Pittsburgh the class of the AFC, with New England, Buffalo, Tennessee and Denver bursting out the gates, and Indianapolis and the New York Jets poised to get rolling once their perennial Pro Bowl quarterbacks get re-acclimated. Yet, here the Steelers are again, knocking on the door of AFC supremacy. The defense is what is seemingly always is: tough, smart, physical and opportunistic. 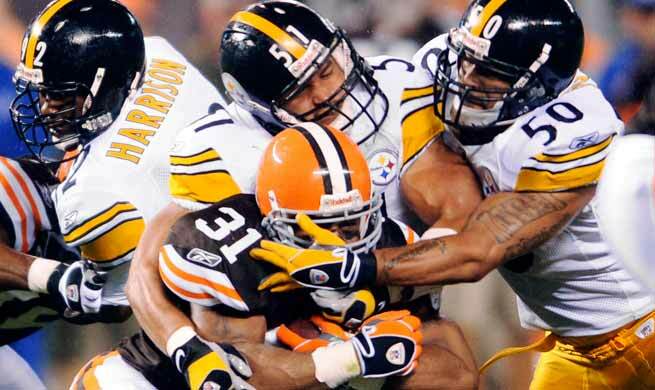 In two games, the Steelers have allowed 23 points, recorded seven sacks and nabbed four interceptions, including two against the Browns, with safety Troy Polamalu's pick of a Derek Anderson pass near Pittsburgh's end zone at the end of the first half spoiling Cleveland's best chance at a touchdown. Offensively, tailback Willie Parker has gone over 100 yards in both games, totaling 243 rushing yards and three touchdowns. He's been so dependable, the Steelers didn't even bother putting rookie first-rounder Rashard Mendenhall in the backfield against the Browns. Quarterback Ben Roethlisberger has been reliable and steady (25-of-33, 323 yards, three touchdowns in two games), as usual, even though he has an undisclosed right (throwing) shoulder injury that coach Mike Tomlin said the team is monitoring. Tomlin would not confirm or deny a report by NBC that Roethlisberger suffered a shoulder separation after being sacked in the season opener against Houston. Pittsburgh's receiving options are getting better now that Santonio Holmes is a big-play complement to Ward. The Steelers' major question mark, their offensive line, is coming around, as Parker's rushing total proves. Pass protection is still an issue but Tomlin is confident the unit will figure it out soon. Where there is concern is in the return game, although the high wind and rain in Cleveland provided ample excuses for things being a relative mess. "We aren't going to apologize for our blemishes" Tomlin said about his team's far-from-flawless performance against Cleveland. "Our guys hung tough and played off each other. I like the resiliency of the men." The biggest difference between Pittsburgh and its opponents thus far -- and likely down the road -- is the Steelers' penchant for making plays when they have to, players say. The two interceptions and Ward's touchdown after he dropped a scoring pass the previous play were the most noticeable examples of execution Sunday night. However, equally -- if not more -- important were a pair of 19-yard gains (a completion from Roethlisberger to tight end Heath Miller and a run by Parker) in the final three minutes, resulting in clock-eating first downs and effectively sealing the victory. There also was a 31-yard completion from Roethlisberger to Ward late in the third quarter, which Roethlisberger uncorked from his own end zone to Ward, who caught the ball near the sideline on the Pittsburgh 33. It dug the Steelers out of a very bad field-position hole, a highly important fact in a game played in a relative quagmire. Ninety minutes before kickoff, Roethlisberger stood in nearly the same spot in the same end zone -- baseball hat on backward -- and repeatedly threw that pass to a team employee in a golf shirt and khakis at the 30-yard line. When it came time to make a play under pressure, it wasn't unfamiliar. The same could be said if the Steelers continue on this winning course. They've been there before, so when it's time to do it again, it won't seem new or daunting.